For as long as she can remember, Kami Glass has had a constant companion in her head, a boy named Jared. To everyone else, he's just an imaginary friend she should have long grown out of, but to her he's much more and that has made her a bit of an outcast. Still, she's pretty happy with her life, and enjoys running the school newspaper along side her best friend. But then her world gets turned upside down when the long absent Lynburn family returns to her little town. Everyone is up in arms about the acts of violence occurring around the town, and they blame the Lynburns. But Kami is pannicking for an entirely different reason. It turns out that Jared wasn't imaginary, but completely real. How do you cope with finding yourself with a complete stranger that knows your every secret and thought, especially one who everyone keeps warning you away from? Kami will have to decide how she feels and fast, because as the bodies start to fall she'll need to know who to trust. Kami is such an amazing character. Quirky and unique cannot even begin to describe this girl as she is incredibly witty and outrageous at times. She is so incredibly strong, and never once backs down from anything no matter the risks. She has this insatiable thirst for knowledge and truth, making her desire to be a reporter extraordinaire an absolutely ideal career choice. She devotes herself 100% to everything she does. It really amazes me that she has been able to keep such a strong personality in spite of her alienation from everyone else due to her connection with Jared. Anyone else probably would have tried to lay low and stay out of the spotlight, but in spite of, or because because of her differences, she makes no hesitation to throw herself out there and shine. Seriously I cannot possibly even begin to explain just how incredible she is, you'll just have to read the book to experience the awesomeness. I simultaneously was enthralled and frustrated with the dynamic between Kami and Jared. Before they met in person, their relationship was magical and rather beautiful, each being the closest and constant companion of the other. They were just so important to one another and I loved the role they played for one another. Then when they actually met in person it all went haywire, and that is where the frustration comes in. The communication in their heads was completely at odds with the way they spoke in person. Sometimes even in the same conversation, there would be drastic shifts depending on whether they spoke aloud or silently in their minds. I understand it had to be a little disconcerting to find out the person who knows all your secrets, and your every thought is real when you had previously thought them to be imaginary. I just couldn't quite understand their utter panic at not touching one another. I mean you would think a relationship between them would have been ideal as they had already been so important to one another for so long. But maybe that's just my own wishful thinking. I'm still in shock over unspoken as I still can't believe a book that made me laugh so hard would so utterly and completely break my heart in the end. I just cannot comprehend the difference from the feel of the start of the book to the final few pages. I seriously feel like I've been put through a wringer and I'm almost at a loss for words. Granted, there was a slow progression from the fun quirky beginning as it transitioned in to a much darker novel later one, but I still would never have predicted the way it turned out. Part of me wants to hate this book for the way it ended and left me feeling so bereft, but in all honesty it is so good that I just can't. 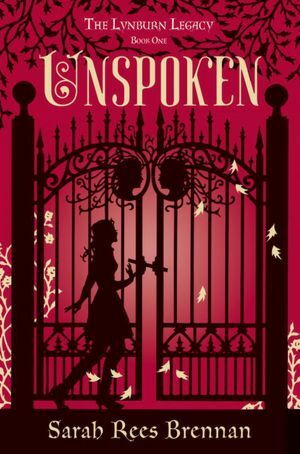 Even now that my heart is in a thousand pieces, I don't regret reading a single moment of Unspoken, but I am incredibly desperate to get my hands on the next installment. 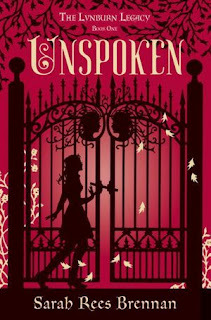 I cannot possibly praise Unspoken any higher, it was beautiful, it was hilarious, and it was haunting all at once, making for an absolutely amazing read. Trust me, you won't want to miss this!